I think of it as a backdrop to my junk gardens. The backdrops add much needed vertical interest, and also break up the large areas of blue steel siding behind my foundation plantings. Read on, for more backdrop ideas! 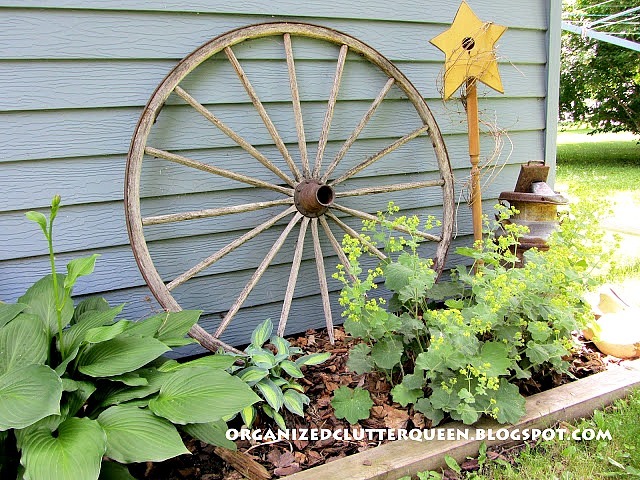 My buggy wheel has also been displayed against a wall in my covered patio area. I brush on Thompson's Clear Water Seal to protect my old wooden items from moisture during the spring and summer, and they spend the winter in a shed. 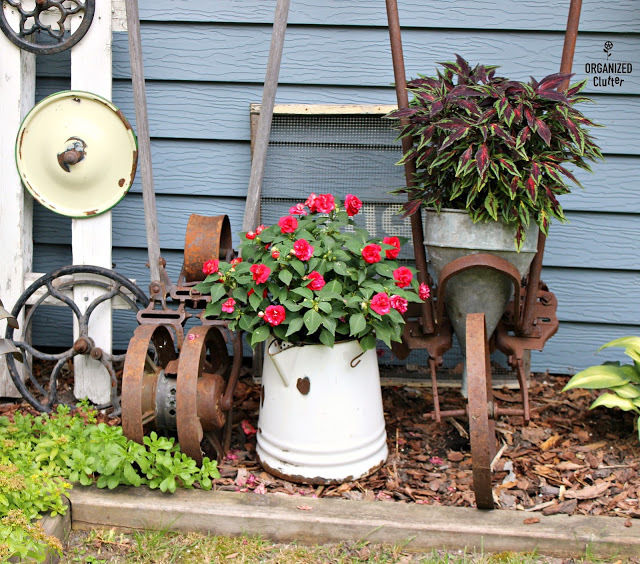 I have smaller iron wheels that I prop up against my deck behind the plantings. I always move this stuff around every season to keep it fresh! I love old doors too. Even screen doors. 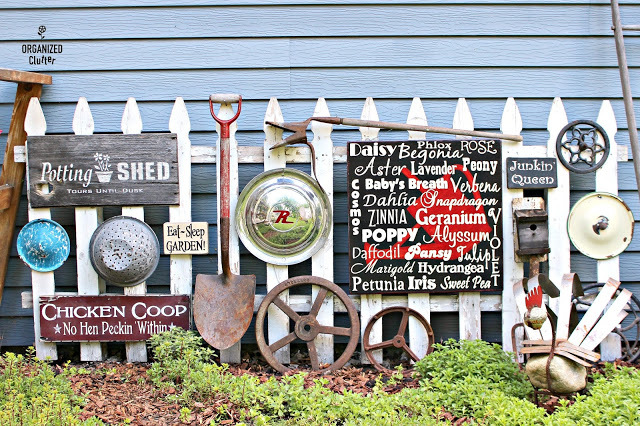 They can hold signs, and add a lot of vertical interest in a junk garden vignette. Barn doors are my favorite! Again, doors can hold signs or even a grapevine wreath. This door has white, chippy, cool, paint patina! 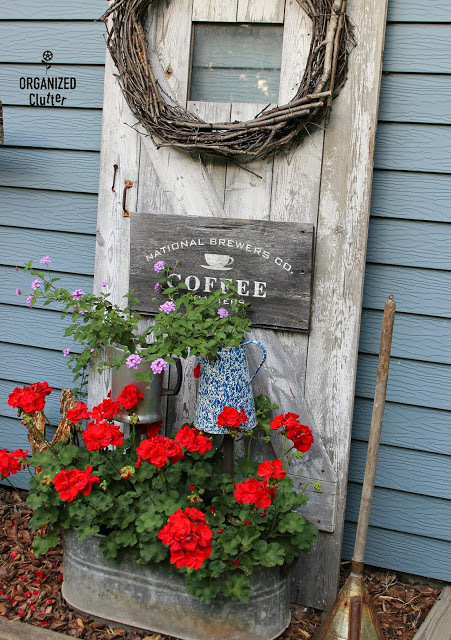 Just imagine this container of geraniums sitting along the house without the door! I have displayed an enamelware pot lid collection on my barn door in prior years. Use your imagination! Make it fun! I also pick up barn door half doors. Not sure if they are Dutch type doors or what, but I find half barn doors. This one had awesome barn red, chippy paint and rusty hinges. I displayed vintage garden tools on a thrift shop gun rack in this picture. 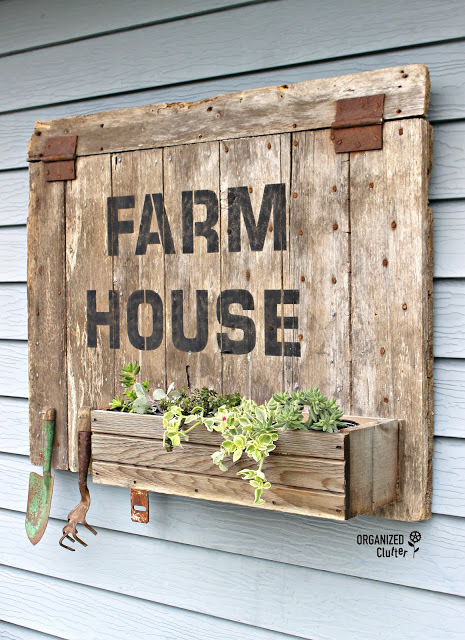 Another half barn door I transformed into a sign/planter/tool hanger. 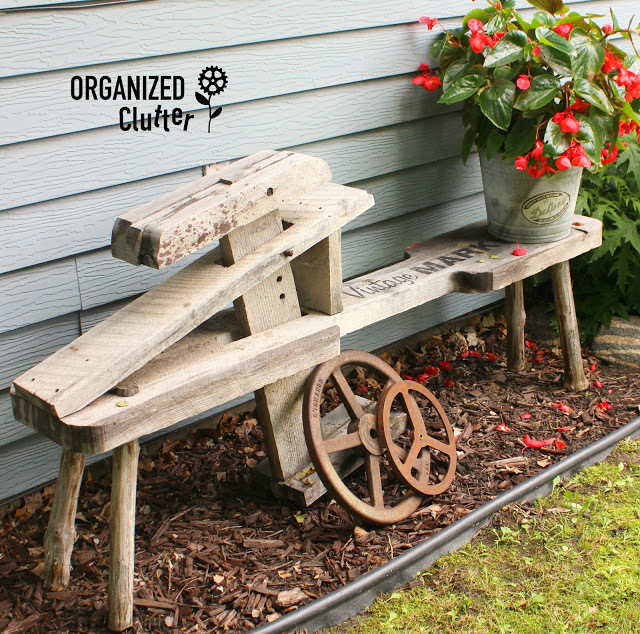 This old wheelbarrow was my very first big junk garden piece. I paid $15 for it a rummage sale about 20 years ago. 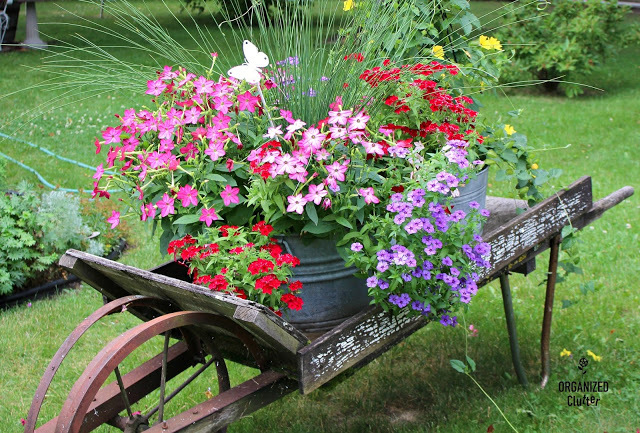 Besides holding laundry tubs with flowers all summer, I use it to haul pots of annuals to the garage if there is an unexpected late spring frost. I can just wheel it inside. 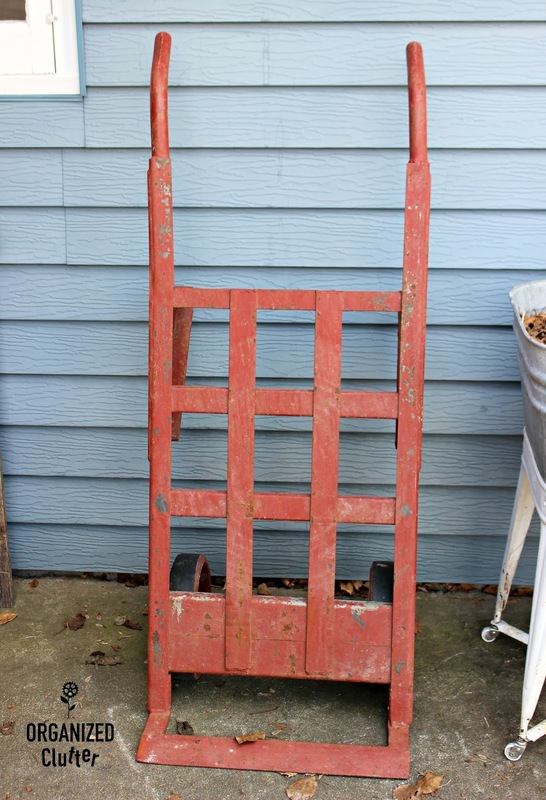 I purchased this sweet little wooden wheelbarrow, with metal front wheel and red chippy paint, last fall. It has not been used in any of my displays yet. 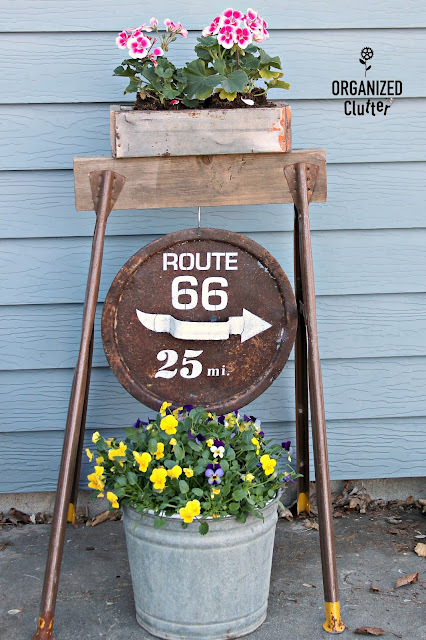 A rusty old wire gate is a great find! This one cost me $20! It hangs on the front of my house. I had a large gate too, (but have since sold it). Here, I hung a red bike wheel with plant tags on it. 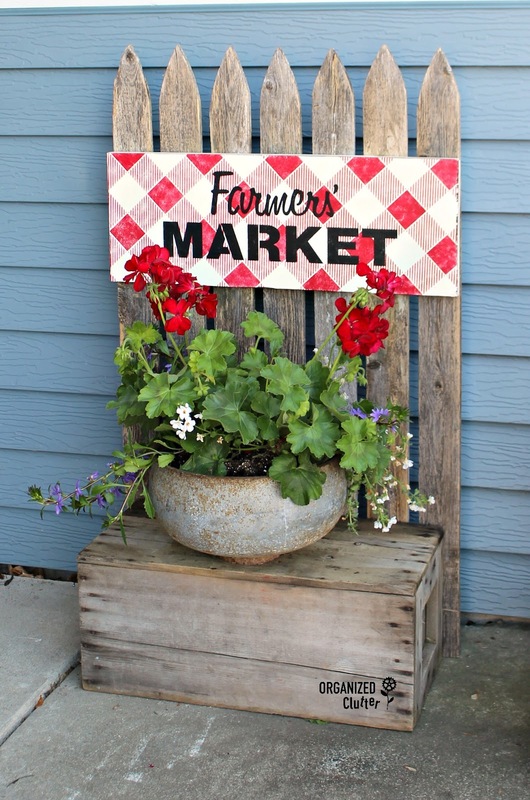 Picket fence sections are great junk garden backdrops too! Heavy pumps and milk cans keep it in place. Here the same white picket fence is attached to the deck rail. I call this my junk gallery fence (instead of a gallery wall)! This project just came together this season. 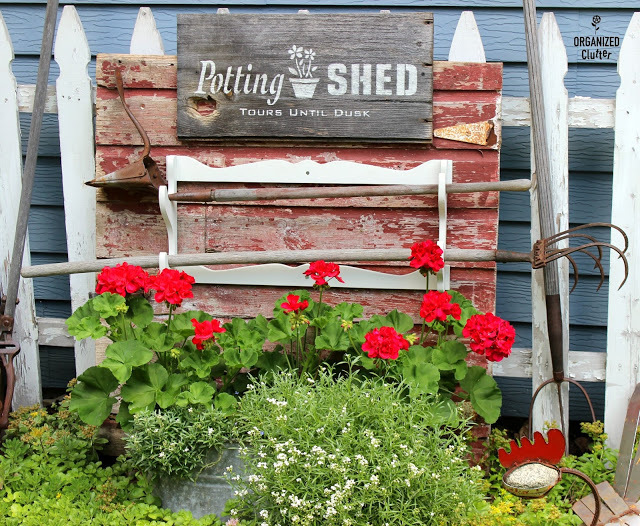 I married a section of picket fence to an old crate for a junk garden display. Sawhorses in the garden were new last season! Tons of vertical interest in and among the border flowers. This small sawhorse was part of a recent junk garden project. 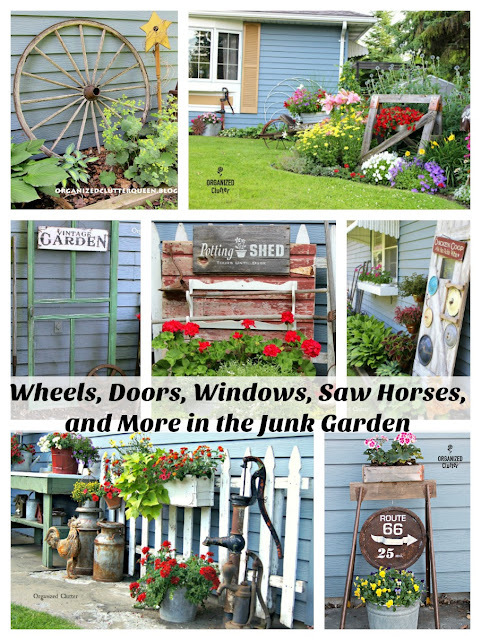 Old window frames with a galvanized flower box are fun junk garden decor pieces. I think you could use a wood one too! I stenciled burlap for the curtain. 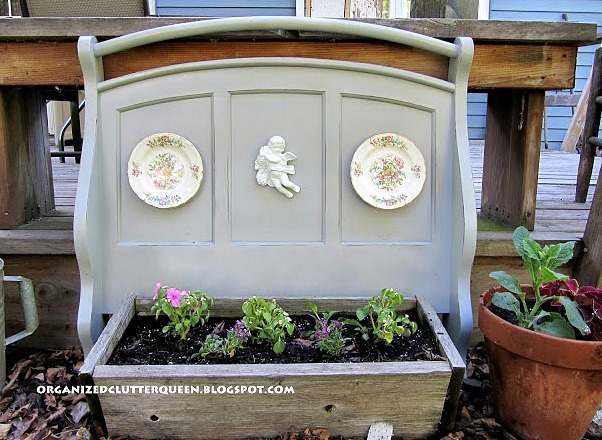 A small window with its glass is a backdrop to this junk garden vignette on a bench on the deck. 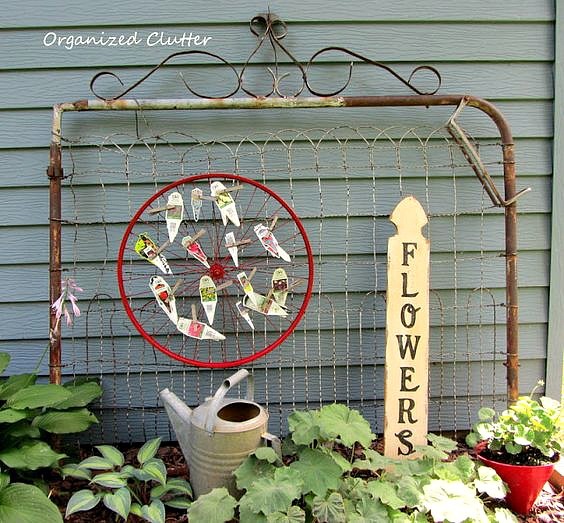 Pick up old window screens for outdoor decorating too. 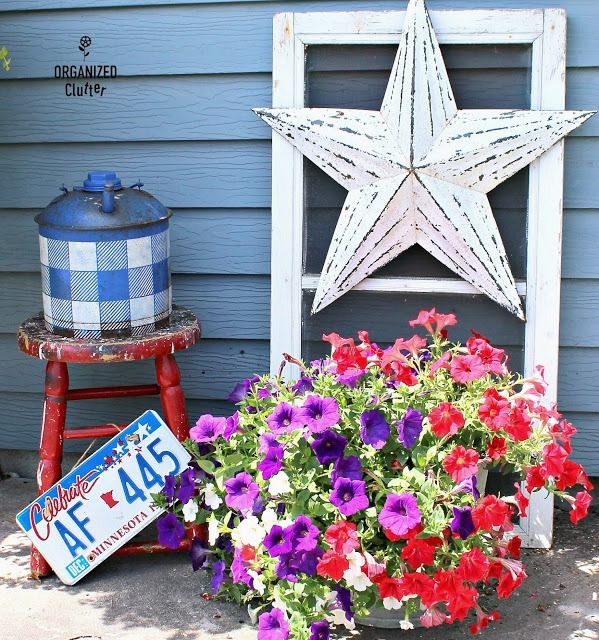 This little patriotic display needed something taller behind the pot of petunias and a screen worked well. Sometimes the unexpected will work as a garden backdrop! Here, broken college futon ends form a backdrop behind wooden planters. Little chairs originally from Pottery Barn (and used in my house) were spray painted a bright color. Another year with the futon ends! And plates. The futon frame back works in the garden too. Here as a backdrop to other junk! 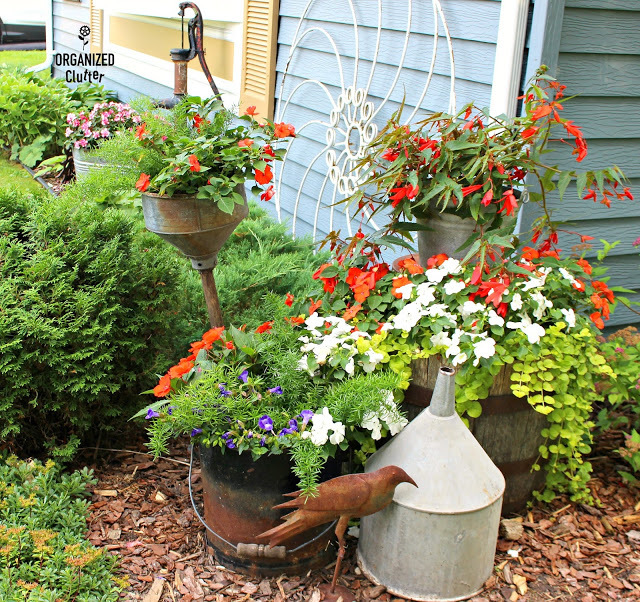 I have old farm cultivators leaned up against my house and in and among my plantings too. Perfect pieces with rust and weathered gray wood. See the white iron round flower against the house? This is from a hay rake. It has been welded together at all the rake ends. I have had this for a long time too, but it is always in this spot! I purchased this thing a few years ago. I didn't really even know what it was. But one of my readers identified it as a draw knife shave horse or bench. I stenciled it, and put a plant on it! I have had this piece a week now. 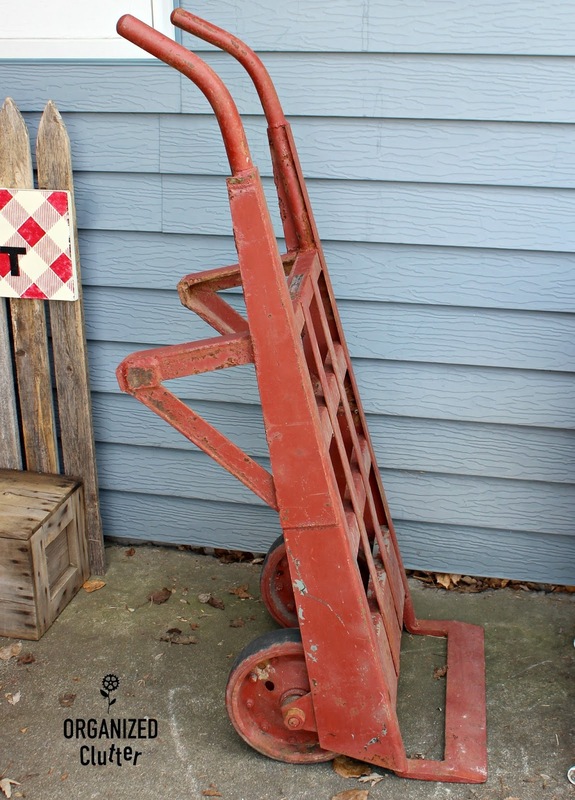 It is a super heavy duty iron industrial dolly. I will be working this into my outdoor junk garden decor this year. Old ladders are great too! 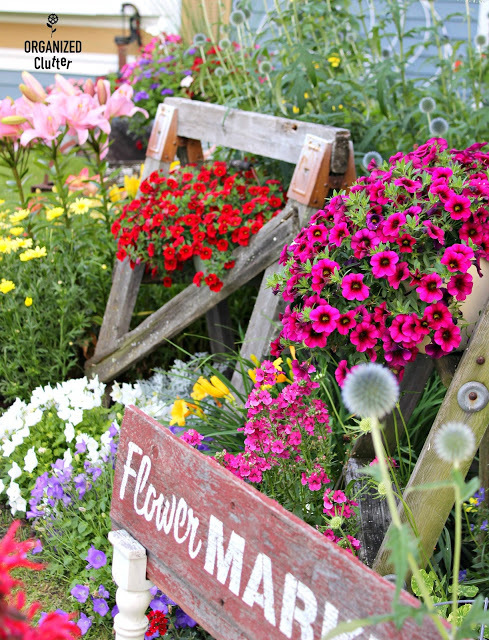 Click here for garden ladder ideas. 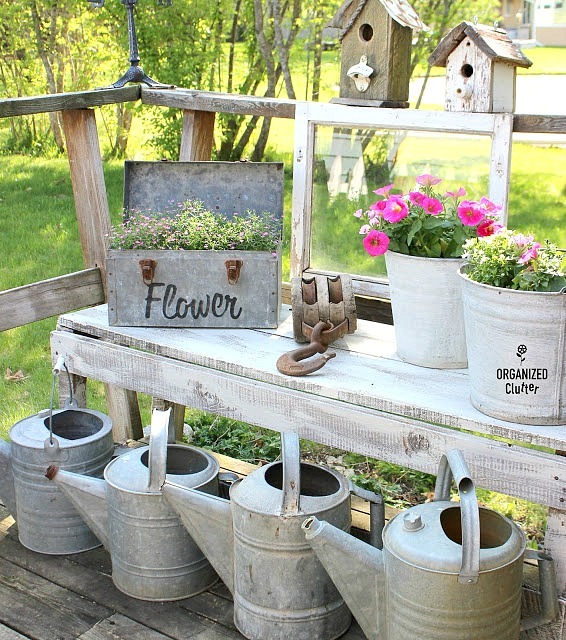 Find some cool junk to display outdoors with your flowers! You are so creative! I love seeing the unique ways you display your "junk"! You have a very creative and imaginative ability to see interesting possibilities in so many unique objects. Tip of the hat to you!